Are you looking to buy or sell a property in Melbourne or further out in regional Victoria? You’ll be needing professional property conveyancing Melbourne services to help you through the legal process of transferring property ownership. At conveyancing.today, that’s what we do best. We remove all the guesswork and uncertainty from transferring property by guiding you step-by-step through the transaction process, assisting you from start to finish. Being unfamiliar with the required paperwork and legal procedures can cause delays. Working with the right Conveyancer Melbourne will save you both time and money. We’re able to offer competitive fixed price conveyancing Melbourne for almost all jobs. Our knowledgeable team is fully qualified with extensive practical experience. We make it simple to get started. Just upload the required documents and away we go. It couldn’t be easier! No team is as dedicated to obtaining real solutions for their clients as we are. We understand a property transaction is important to you. Our professional staff are committed to ensuring you are kept informed every step of the way. Our dedicated conveyancing firm is founded on forward thinking, knowledge and experience. Why do I need a Conveyancer Melboourne? Transferring property ownership into or out of your name requires necessary skill and attention to detail — especially if you want it done right the first time. As an experienced team for Conveyancer Melbourne and regional Victoria, we offer efficient and reliable assistance with property transactions. From negotiating the contract to dealing with banks and undertaking the right searches to protect your interests, we’re focused on your needs. As a member of Property Exchange Australia (PEXA), we’re able to offer you a streamlined service with PEXA electronic Conveyancer Melbourne transactions. With PEXA, on-time settlement and fast access to cleared funds are just some of the benefits. As a leading Conveyancer Melbourne & regional Victoria, we recognise that you are the most important person in this process, which is why our main goal is to ensure that everything is kept simple, quick and stress-free for you. 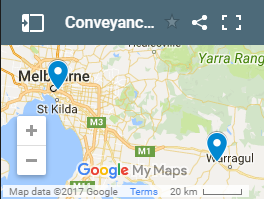 conveyancing.today is a small, dedicated Melbourne based conveyancer, which means we can focus on your particular property sale or purchase, protect your interests and keep you advised throughout the whole process. From our initial consultation with you, we can advise you on your particular conveyancing Melbourne matter, taking into account your individual circumstances. The decisions we make involving property are life-changing. To help you make those important decisions, our team at conveyancing.today can take care of all the legal elements with the help of in-house solicitors. We make it easier by explaining the process in a simple manner our clients can understand. Whether you’re buying or selling, our property transactions experts are here to help you realise your dreams. Your transaction is in safe hands with our team overseeing the entire process. Buying a first home can be a stressful experience, but Kylie and the team at Conveyancing.Today made the entire process run smoothly. From reviewing potential contracts for any nasty surprises to finalising the settlement on our perfect house, Kylie's extensive knowledge gave us the confidence and peace of mind that we had made the right choice. We love our new home, and we are thankful that we could focus on the excitement of moving in rather than stressing about complicated paperwork thanks to the conveyancing being in the expert hands of Conveyancing.Today. I would highly recommend using conveyancing.today for your conveyancing needs. Staff were professional and helpful when it came to the purchase of my new home. All of my questions were answered and I was kept well informed through the entire process. Thanks conveyancing.today! Thank you so much for helping my partner and I with our conveyancing on our new home. You were so delightful and knowledgeable and no question was too silly or hard for you to respond to. The process of owning our home was made so much easier and it was a pleasure dealing with you. I would highly recommend you to friends and family. Highly recommend Conveyancing.today! They go above and beyond to help you in every way possible. From start to finish they are always there to assist. Happy to answer any questions and guide you the whole way! © 2017 conveyancing.today, All Rights Reserved.